This week has seen another local contractor earth moving, utilising the clay-soil deposits from the debris of the lake, to form the basis for new raised footpath improving access and supporting the original failing retention wall, all on the North West side of the Park. 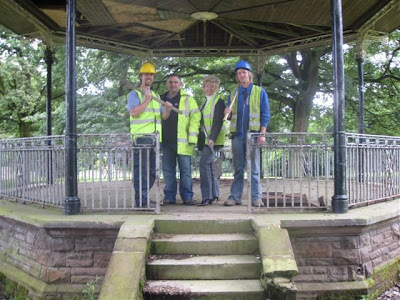 Even more exciting is that the Cheshire East specialist restorers ‘Lost Art’ has been appointed to complete the Bandstand refurbishment and works commenced this Monday (20th). At a recent meeting with the Heritage Lottery and Cheshire East Council all parts demonstrated their commitment seeing the works progresses and finalised. As the original contractor went into administration, the project legalities and the stoppage of works caused frustration, both within the Authority and to members of the public. The Bob Field Memorial Grands" will be hosted by CGR in partnereship with Cheshire East Council at the Shanaze Reade BMX Track, Tipkinder Park, Crewe. The play area at Leighton Park is going great guns and must be near completion. Its interesting to note the post at the back for CCTV. Derby Docks has begged for CCTV for years and never got it despite the under age drinking and drugs in the area. Leighton Park has had a fair few play areas in the past and they never last very long lets hope the CCTV helps to keep them in one piece. Please be aware of some of the MO's (Modus Operandi / Modes of Operation) that have been used throughout Cheshire recently to try and gain entry to residential properties. Offenders tend to be male and in the majority of cases target elderly or more vulnerable people. None of these incidents have occurred in the Crewe & Nantwich area but it is worthwhile to be forewarned about these methods as people who are involved in distraction burglaries are often fairly mobile and don't remain in the same area for long to minimise their chances of being identified. 1.) Male approaches property claiming that he is from the water board and he needs to turn the water off for 48 hours as there has been an explosion. He asks her to take him through to the kitchen and to empty cupboard under the sink whilst he turns the taps off. At this time a second offender has entered the property, made and untidy search downstairs and removed cash from the property. 2.) Male knocks on door of property stating that he needs to change the battery in the gas meter. When questioned as to where he was from he retorted 'do you want it doing or not'. The resident declined and the male left. 3.) Male calls at residential address asking if resident wants any work doing to his guttering. Resident declines but later sees same male coming out of elderly neighbours house. He enquires with neighbour and learns that the male claimed that he had done some work for the lady and she has given them £10 and is now unable to find her purse. Please remember that although the more standard MO for distraction burglaries involves males posing as tradesmen that women / smartly dressed individuals can also be involved in such incidents so exercise caution regardless of who is at your door. As autumn and winter approach many of us will plan out planting for our gardens for the next year. Your gardens can be excellent tools in trying to prevent people from gaining entry to your property. With a little bit of clever planning you can enhance your security. 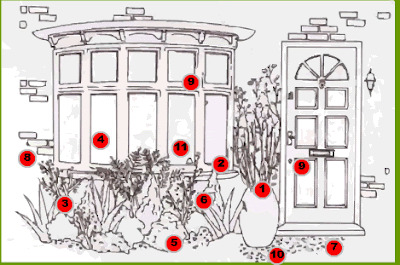 Please find below some illustrated ideas about how you can create an attractive garden that deters burglars and provides additional security for your home. 1 - Climbing Rose: Bramble like stems are covered in sharp, hooked thorns which make it difficult for would-be burglars to reach the window or door it surrounds. 2 - Juniperus chinensis Evergreen conifer. Planted in appropriate places it's density and needle sharp leaves can deter people from getting close to the 'Obelisk' property. The needles grow to 15mm in length. 5 - Holly Evergreen shrub or tree with prickly leaves. Providing round the year cover. 8 - Bamboo Attractive feature. When planted against walls or fences it will prevent burglars climbing into upstairs windows alerting you to their presence. If the canes are forcibly broken they will make a loud snapping sound. 9 - Window/Door locks Ensure all windows are fitted with security locks. Front and rear doors should be fitted with mortice locks (BS3621), hinge bolts and no weak panels. Door frames should have secure frames. Add motion sensor lights around the exterior of the house and garden. 10 - Walls, fences Supplement walls, fences and railings with thorny shrubs. Higher fences - existing fences made higher with trellis (minimum of 1800mm railings and gates high). Fit gates to all access points with locks and ensure you lock them. 11 - Home Watch Congratulations you have already covered this element of suggested crime prevention by running/participating in your local Home Watch scheme. This provides natural surveillance allowing people to report suspicious behaviour and to look out for each other. I attended the stakeholders meeting held at the park on Wednesday 8th July. There has been little or no visible work done at the park for months but thats all about to change. The new tender should be opened this week and hopefully a new contractor appointed very quickly. There has been a delay as after the tenders were in one contractor reduced the price and as a result other had to be given the opportunity to resubmit tenders. At the meeting the Lions came with some cash to build a sensory garden like the one a Stapley Water gardens so that is another new feature which should be a major attractions and as the Lions are funding it there is no messing about getting the money. The meeting discussed that the stakeholder work would be done once the park was finished and then a friends of the Queens Park would take over to make decisions about the park and see that its maintained and looked after. This will be open to anyone and will shortly be setup as a charity so they can get funding for any future projects. The work on the wall were the Bats have held up work is now due to start this week and should be finished in a month. This also means the railings can then be finished as there is only this small section to do. We will have pictures as soon as there is signs of life. Work on the bandstand is also imminent. The summer bedding is now starting to flower and will soon be in its full glory as can be seen above taken after the meeting. 1st & 2nd Aug TipKinder - Bob Fields GRANDS incl. "The Shanaze Reade BMX Track"
West St is in grid lock as the improvements keep closing the road add to this the fact that Alton St is closed for new water pipes and the town is in chaos. Many of the shops down West St are complaining they are loosing trade as people cant get to there shops. The work is going on until October and the road will have to be totally closed at some point. Lets hope its all worth it in the end. Householders are warned to be on their guard against doorstep salesmen insisting they need a new TV aerial before the digital switchover in 2009. Cheshire Trading Standards officers have received several reports of traders cold-calling the elderly and vulnerable who claim their existing aerial will not receive a digital signal and urge them to pay for a replacement. Digital UK, the not for profit organisation leading the switchover process, says most aerials will work perfectly well with digital TV. Jo Waters, Granada Regional Manager for Digital UK, said: “There is no such thing as a digital aerial – as long as it is in good condition your current aerial should be able to receive a digital signal after the switchover. The digital switchover for the Granada region is scheduled for 4 November 2009. An aerial test on Teletext page 284 will help viewers to determine whether their aerial will be good enough to receive a digital signal. Digital UK advises that the installation of a standard new roof aerial for one property should cost no more than £80-£100. Trading Standards Investigations Manager Andrew Rees said: “We advise householders never to enter into contracts with traders who cold-call. “Anyone requiring a new aerial should use a local supplier with a good reputation who is prepared to give customers time to think about a quote. Ensure the firm has an address and telephone number which can be verified. Digital UK is working in partnership with local charities and volunteers to provide advice and assistance for those who may need a little extra help. Its Switchover Help Scheme offers assistance and equipment to convert one television for those aged 75 or over, registered blind or partially sighted, on certain disability benefits or living in a care home. Those eligible will be contacted in April-June 2009. Trading Standards can be contacted on 08454 04 05 06. Those that know me know I walk 10 miles a day with the old dog and I enjoy a nice country walk. So off I went onto the Georges playing field down the path by the Golf coarse and came to turn right to go by the river. There are two walks one you go past the river and turn right and one before the river. Well if you look at the photo above can you see the foot path? Neither could I its so over grown and covered in nettles its un passable and we are being denied this lovely walk by the river. I had to go on to the next path above which is rapidly diminishing as the weeds overgrow the path. Who takes care of these paths now we have a new council? Any ideas so we can get it cut back?